Johnson's response to his impeachment was, "Let them impeach, and be damned." In the spring of 1868, Andrew Johnson became the first President to be impeached. The heavily Republican House of Representatives brought 11 articles of impeachment against Johnson. Many insiders knew that the Congress was looking for any excuse to rid themselves of an uncooperative President. Impeachment refers to the process specified in the Constitution for trial and removal from office of any federal official accused of misconduct. It has two stages. The House of Representatives charges the official with articles of impeachment. "Treason, Bribery, or other high Crimes and Misdemeanors" are defined as impeachable offenses. Once charged by the House, the case goes before the Senate for a trial. In this cartoon, President Johnson is depicted as Sampson, tearing down the temple whose pillars read, "Stanton," "Reconstruction," and "Sheridan." 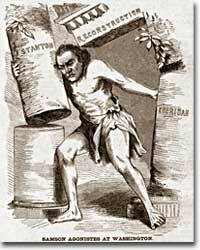 In 1867, Congress passed the Reconstruction Act, which Edwin Stanton, as Secretary of War, was charged with enforcing. Johnson opposed the Act and tried to remove Stanton — in direct violation of the Tenure of Office Act. Nine of the articles of impeachment related to Johnson's removal of Stanton. Another two charged Johnson with disgracing Congress. Johnson's defense was simple: only a clear violation of the law warranted his removal. Should Johnson have been removed from office when he was impeached? But as with politics, things are rarely simple. Other factors came into play. Since there was no Vice President at the time, the next in line for the Presidency was Benjamin Wade, a Radical unpopular with businessmen and moderates. And along with legal wrangling, assurance was given from Johnson's backers that the Radicals' Southern policies would be accepted. In May of 1868, 35 Senators voted to convict, one vote short of the required 2/3 majority. Seven Republican Senators had jumped party lines and found Johnson not guilty. Johnson dodged a bullet and was able to serve out his term. It would be 130 years before another President — Bill Clinton — would be impeached. From: Eric Foner's Reconstruction America's Unfinished Revolution, 1863-1877 the tale of Johnson's impeachment trial. Foner is able to convey complex topics in language that's easy to understand. Foner comes at the impeachment trial from many angles and he includes fun things like bookmakers' odds on acquittal. Take an interactive impeachment quiz put together by the Washington Post. 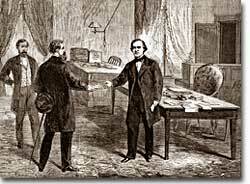 Questions deal with Andrew Johnson, Bill Clinton, and the nature of impeachment. This is an opportunity for you and your class to retry President Andrew Johson. Just follow these instructions for the "Impeachment Simulation Game."